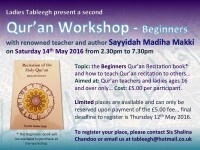 Ladies Tableegh invites sisters aged 16 years and over, particularly Qur’an teachers, to attend a Qur’an workshop with renowned teacher and author Sayyidah Madiha Makki on Saturday 14th May 2016 from 2.30pm to 7.30pm at Husaini Islamic Centre, Peterborough. 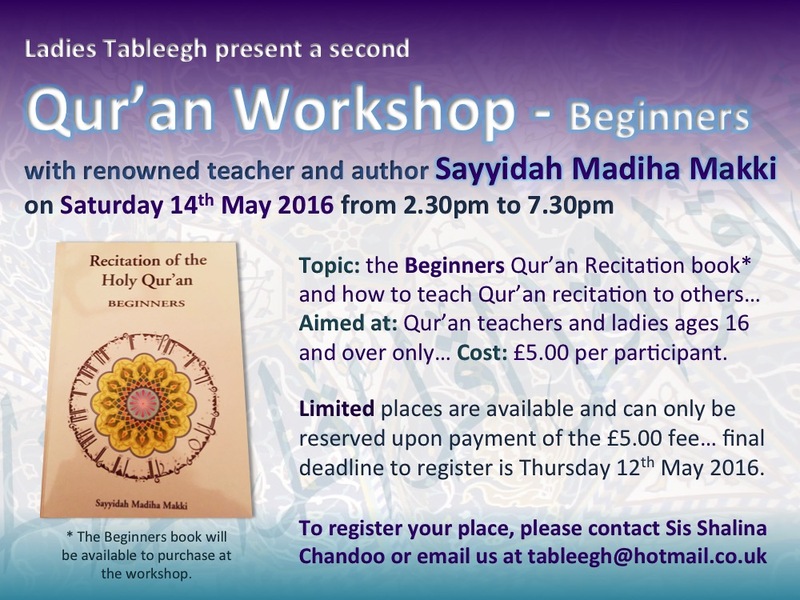 The workshop will cover the Beginners Qur’an Recitation book and how to teach Qur’an recitation to others. 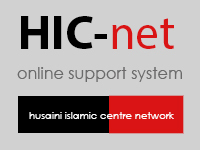 Cost per participant is £5. Limited places are available and can only be reserved upon payment of the £5 fee. For further information or to register, please contact Sister Shalina Chandoo or email us at tableegh@hotmail.co.uk.